Human beings have cycles built into the architecture of their minds. The cyclical patterns of the seasons provided our ancestors their livelihood and the movement of the stars their philosophy. The cycle of the generations, the menstrual cycles, mood cycles, the business cycles that govern the economy... they all provide the rhythms that make up our world. 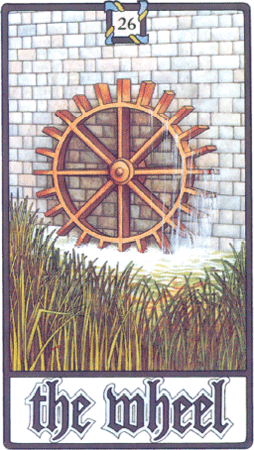 The Wheel Card seeks to remind us to understand our own cycles and rhythms. Planting seeds in the autumn will usually be unproductive, so too initiating a relationship or starting a business will only be fruitful when you are ready for it. We all have patterns- or biorhythms- and we need to understand them in order to take advantage of them.